This fortnight Patter has given us the word "Father" to use for our choice of scripture on our art. 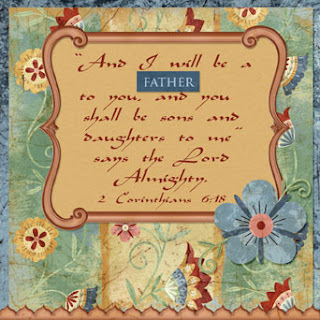 The scripture I chose makes me think about the privilege it is to be a daughter of the Lord Almighty and at the same time a responsibility to be the best daughter I can be. For my digital art I have used items from a kit called "Up at the Villa" by Erica Hite. I chose this kit because it had the word art "Father" so that was my starting point. The font I used is called "Sinbad". This is such a pretty page! LOVE that verse and the colors you used are so beautiful! We are so blessed to be children of our Heavenly Father!! Ooh, I love this ! The old feel about it. The journalling on the scroll background looks lovely.